Summer course Creative Pattern Cutting. 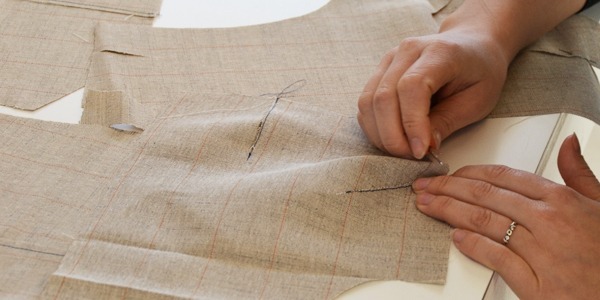 Shaping a garment requires patience and a good eye for detail, with fashion designers constantly striving to create the perfect cut or drape. A pattern cutter plays an extremely important role in turning ideas into a design reality. This course is uniquely tailored for those with an interest in exploring the potentials that creative pattern cutting can offer to the design stage of the fashion industry. Within this course you will have the opportunity to study a variety of different techniques that can be applied to the pattern cutting process, giving you awareness into how it is created and developed and the basic principles of creative pattern cutting to support the development of original problem solving and practical skills required by pattern cutters today. These subjects will introduce you into the fundamental knowledge of identifying and recognising how to work with a basic block in readiness for the full manipulation of creative cutting. You will explore the principles of closing of the darts and creating fullness through a variety of techniques. These will be delivered through a series of practical demonstration and will allow you to practically apply the principles through your own interpretation. As part of the course, you will learn how to use basic shapes to develop a range of different types of creative fashion garments. This will be achieved through a range of innovative cutting techniques that will encourage you to develop your own personal responses from the demonstrations being delivered. This element of the course will allow you to use a variety of different techniques giving you a greater insight into the development of creative cutting. You will examine and develop an understanding of how further three dimensional application to patterns can actually enhance and flatter the female form. You will consider proportion and scale through three-dimensional cutting and appreciate the practical knowledge of working with 3D shapes. You will build your knowledge by being encouraged to unlock the potential of your existing pattern cutting skills. You will discover the creativity of your own discipline by developing new practical, analytical and interpretative skills. You will produce a body of 2D and 3D work, that will encourage further personal responses to the techniques delivered throughout the programme. Read what former Summer course student Catia has to say about her experiences at the Amsterdam Fashion Academy and the Creative Pattern Cutting course. Who should attend this summer course? This course is open to all students at any age, with varying levels of experience, including beginners. It is an intensive one-week programme for who are looking to broaden their understanding of fashion. There are no formal entry requirements and no age limits. It is a one week course from Monday till Friday 9.30 a.m. till 4:00 p.m..
9.30 a.m. – 4:00 p.m.